During 2016, the National Museum of American History has adopted “America Participates” as its theme. Naturally, my own thoughts have turned to how Americans have participated in innovation, both yesterday and today. In this post, I’ll describe how the democratic features of the United States Patent System enticed a broad spectrum of the American population to become inventors in the 19th century. The ensuing Patent Act of 1790 duly granted inventors the exclusive rights to their inventions for 14 (later 17) years. In exchange for this temporary monopoly, the inventor was required to publish a full description of his invention (the patent), which became freely available for public use after the term expired. When the Patent Office examined new and useful ideas and granted its imprimatur, the resulting patent became a secure form of intellectual property—a tradable capital asset that inventors could sell, license, or exploit as the basis of new entrepreneurial ventures. Overall, the founders believed the temporary patent monopoly would economically incentivize inventors to create more new technologies, while the eventual free and widespread use of those technologies (after the patent’s expiration) would benefit the public. Long before 1790, many European nations and city-states had already established patent systems. For example, the Venetian Patent Statute of 1474 allowed inventors to register their devices with the local government and receive 10 years of protection against infringement. However, former Lemelson Center fellow Zorina Khan has argued that the American patent system differed considerably from its predecessors in her book, The Democratization of Invention: Patents and Copyrights in American Economic Development, 1790-1920 (New York: Cambridge University Press, 2005). In France and Britain, for example, patents were grants of monarchial privilege conferred only upon wealthy elites. High registration fees meant that inventors patented major, capital-intensive inventions but not incremental improvements, effectively discouraging continuous innovation. Plus, European patents were precarious and could be overturned by an unpredictable judiciary or revoked by the Crown. In contrast, the US patent system was an impersonal and transparent bureaucracy. After 1836, a merit-based examination system awarded patents to the “first and true inventor”—even women, former enslaved African Americans, and foreign citizens—who were otherwise disenfranchised. Unlike Britain, US registration fees were modest and patent specifications were publicly accessible, encouraging continuous improvements and technological diffusion. Furthermore, the early federal courts affirmed that patents were a secure form of intellectual property. The result of these policies, Khan argues, was the “democratization of invention.” In short, inventors-entrepreneurs could easily access and trust the protection of the America patent system, and this encouraged a broad cross-section of Americans to participate in innovation during the 19th century. The United States Patent Office was an accessible and transparent bureaucracy. In fact, the Patent Office encouraged ordinary citizens to examine its museum of patent models as a source of national pride and inventive inspiration. 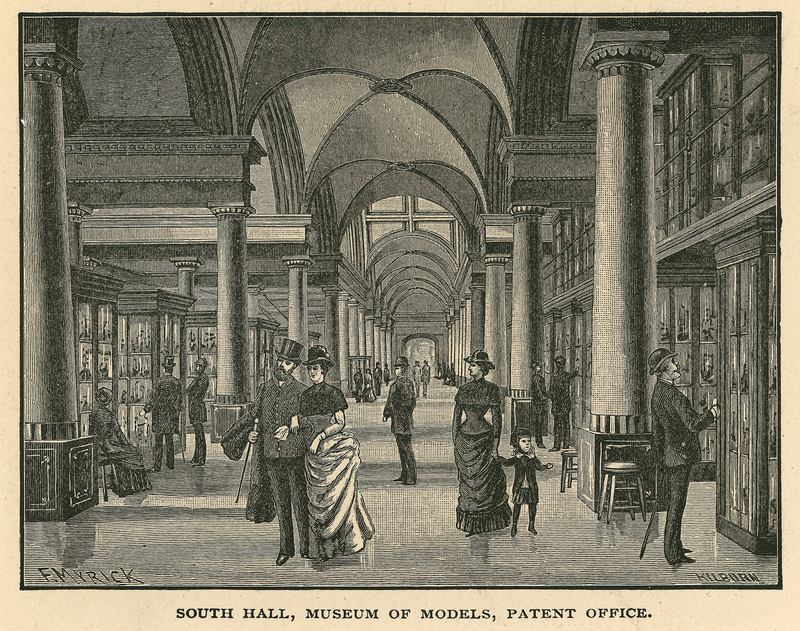 Image: South Hall, Museum of Models, Patent Office. Illustration from Joseph West Moore, Picturesque Washington: Pen and Pencil Sketches, 1887, SI negative 2008-4988. Khan, an economist, analyzes a sample of US patents from 1790-1846 and links them to biographical information in city directories. She finds that expanding domestic markets led to an increased rate of patenting, as ordinary American citizens, not just professional technicians, availed themselves of the economic opportunities presented by the patent system. The increased rate of patenting was largely attributable to “low-commitment” inventors, one and two-time patentees who possessed moderate technical skills generally available throughout the population. For example, future president Abraham Lincoln was granted US Patent No. 6,469 on May 22, 1849, for a device for "Buoying Vessels Over Shoals." At the time, Lincoln was practicing law in Springfield, IL after serving one term as an Illinois congressman in Washington, DC. His idea was to equip boats with inflatable bellows of "india-rubber cloth, or other suitable water-proof fabric" alongside the hull. The idea was inspired by Lincoln’s experience running aground during the many river and lake expeditions he made as a young man, ferrying people and produce on the Mississippi River and Great Lakes. Lincoln was a self-taught lawyer, not a technician, and he never manufactured the device. Nevertheless, Lincoln retains the distinction of being the only American president with a US patent. 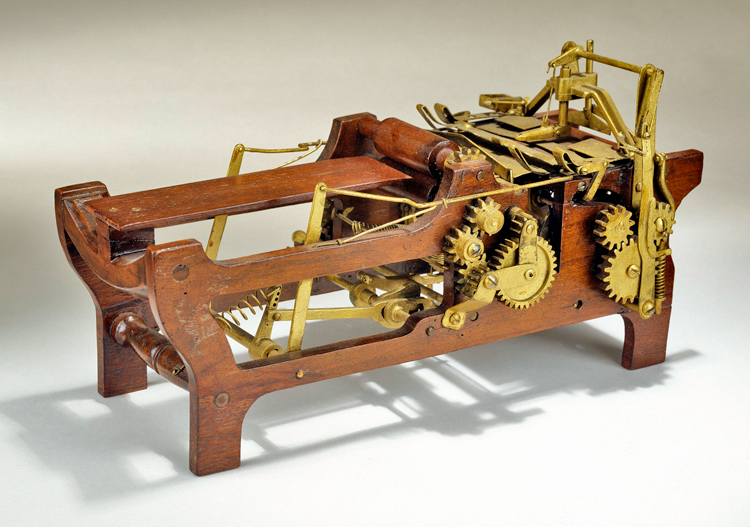 A model of McCoy’s hydrostatic lubricating system for steam engines, photo courtesy of The Henry Ford Museum. Overall, the 19th century American patent system was much more accessible and democratic than its European counterparts. In fact, it was one of America’s most democratic institutions, especially during a period of disenfranchisement when women and African Americans still had limited political rights. Our democratic patent system, in turn, encouraged a broad spectrum of Americans—including a former Congressman and future president, an ingenious young woman, and the son of former slaves—to participate in innovation. Roiberto Berveglieri and Carlo Poni, “Three Centuries of Venetian Patents: 1474–1796,” Acta historiae rerum naturalium nec non technicarum 17 (1982): 381-93. B. Zorina Khan, The Democratization of Invention: Patents and Copyrights in American Economic Development, 1790-1920 (New York: Cambridge University Press, 2005). Owen Edwards, “Abraham Lincoln: The Ingenious Inventor,” Smithsonian Magazine, October 2006, http://www.smithsonianmag.com/history/inventive-abe-131184751/, accessed 11 February 2016. Anne L. McDonald, Feminine Ingenuity: Women and Invention in America (New York: Ballantine Books, 1992), 50-56. Patricia Carter Sluby, The Inventive Spirit of African Americans: Patented Ingenuity (Westport, CT: Praeger, 2004), 64-69.